Why Personal or Life Coaching? Why Corporate & Executive Coaching? Last night, I went for a walk, stopped by the pool, lay on the lounge and communed with my mates (my epic team of Divine Helpers), looking up at the dark night sky which immediately filled with rainbow light everywhere! The ENTIRE sky!! And it was only visible to me. May we all be our Multidimensional Selves now! NOTE: It wasn’t a rainbow across the sky, like we usually see, it was literally rainbow light filling up the whole sky!! RAINBOW LIGHT FILLING UP THE WHOLE SKY!! The same thing happened again, yesterday evening but it wasn’t dark yet. I had lain by the pool on my way home, as I did before, enjoying the peace and quiet, and the nature around me. I looked up at the sky and again, I saw rainbow frequencies and this time, soft pastel pink hues as well, visible only to me. 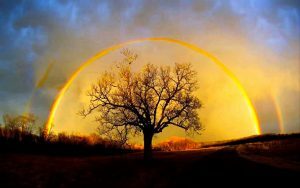 In fact, we can see rainbow frequencies anywhere, anytime, depending on which dimension we live in. I’ve been seeing them for years, with my eyes closed, probably since 2012 but now, I see them all the time, even in my apartment, with my eyes wide open. It’s just extra beautiful and awesome, seeing them in the wide open space of the evening sky, reminding me that I am on New Earth, which is relaxed, joyous and abundant – not in the same way that the human self thinks of abundance but in a much deeper, richer and infinite way that the human mind cannot quite grasp. It’s wonderful to be Home, free of the constraints of the human mind and persona. Don’t waste time defending the human self, which is to be loved but not mollycoddled. Don’t delay hanging on to the lack and limitations of the self, when you can SO easily rise up and be the Self that you already are and have always been. It is only the fear and ego-based human mind that will come up with ideas and tricks to delay your true liberation, empowerment and joy, your true rising and thriving at all levels! I Love You. I Love All. Peace & Plenty For All. TIME TO RISE COLLECTIVELY, AS A SPECIES!